No time to go to a gym? No time for exercising? There is another way of burning calories! Climb up the stairs! There are many health benefits of climbing stairs. It can be a good exercise for people who can't spare time for exercise. 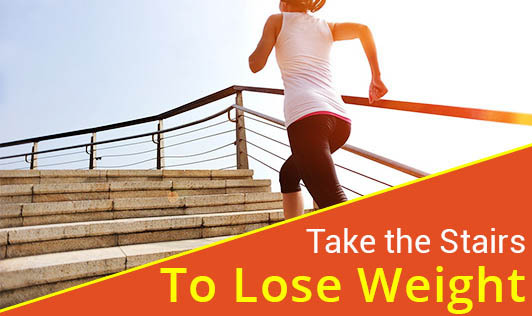 There is no need to buy a stepper or a stepping machine, just take up the stairs every time you want to go to the upper floor. One of the major advantages of this activity is that, it is free of cost! Climbing stairs requires a lot of stamina. It can be a very good cardio activity if done regularly. When you do it as an exercise, one flight of stairs won't be considerable; do it for a longer time. Cardio activities are known to improve the health of the heart muscles. Your heart has to pump more blood to cope up with the increased requirement due to the exercise. Gradually, the cardiac muscles will be strengthened by such activities. This kind of an exercise is a direct way to weight loss! When you burn calories in the form of fat, you lose weight healthily. Climbing stairs is not only good for weight loss, but also for toning the muscles. It can help to tone the muscles of legs and increase the strength. So, apart from being a good cardio activity, it proves to be good strength training for your leg muscles. Overall, climbing stairs will prove to be a very good form of exercise for all the people whose knees are ready for the flights of stairs. Before you take up this activity, consult your Physiotherapist if you have any knee problems or you are obese or you have high blood pressure or if you are a cardiac patient. Take the stairs to good health people!